Need Furniture For Outdoors ? Indonesian teak patio furniture is a great option if you are looking for wooden outdoor products which have great value over the price. Indonesian forest are one of few country in the world that producing best quality teak wood that money can buy, so you will get high quality wooden material for your outdoor furniture products. Beside good quality material, Indonesia are famous for wood working culture which means good craftsmanship. Especially in our city jepara, that was well known worldwide for wood carving skill that has been pass on from generations. We have many experiences of producing and sending out containers of teak outdoor furniture products to American and European market. Most of them are small to medium furniture store and also some project manager who need a custom made furniture design which perfect in our vision. we make classic design outdoor furniture that you may have known and see in regular market, but we constantly developing new design to give more and fresh option to our customers. As we mention above, high quality raw material and good craftsmanship are the main reason to buy outdoor furniture from Indonesia, but there is one special things that will be a benefits to buy garden furniture from medium size furniture company like us, which is we have low MOQ (Minimum Order Quantity) and you can do custom design order. This will be beneficial to small furniture store and furniture project that only require small quantity order and had a specific design that not available on the regular market. We have a good relationship with local furniture manufacturer that have been a local major business here in jepara city, This kind of relationship give us capability to fulfilled the quantity and time scheduled from our customers demands. and also keep small furniture workshop in jepara city to continue their production. this is of course under our strict quality control department watch to make sure everything is match with our standart. It’s a common question on every website or forum, why teak ? because teak are the best wood available for outdoors…that’s it, and that is the correct answer. teak are very strong and have water protection characteristics due to rich natural oils. they turn to grey patina color if exposed to direct weather but its easily restored by sanding and finishing. but why we actually use teak ? it’s because they are locally grown here in indonesia and easy to have the raw materials. yes it is our fortune to have one of the best wood in the world to grown on our backyards, and we surely grateful with that by taking care of our teak forest and take part for government policy against illegal logging. All of our indonesian teak patio furniture product are use certified legal wood. which we hope able to maintain our forests from unresponsible scum illegal loggers. Outdoor furniture are mainly use..of course..outdoors, but beach are most common place where this kind of furniture will be use, and we know that beach had a salty air which not really get along together very well with metal. We use various hardware materials in our outdoor furniture products, start from electro plated steel, cast brass, stainless steel, aluminum and many more. all those materials must have corrosion resistance against outdoor weather especially salty air, because most of our customers use their product near to sea which salty air is always around. we put special coating onto our hardware to prevent damage and much longer durability during use. poly urethane base materials with powder coating system is best in our experience to cover this task. so when you buy our product, you will also have this special coating fit in your furniture. Yes it is still same teak wood, but do you know that there is a different ? teak tree that grown in a fertile soil are more likely to have defects. they grow so fast due to rich nutrient in the soil but in other hand, the wood grain became less dense and not tough enough to “beat up” as an outdoor furniture. on the other hand, less fertile soil produces teak tree that so long to grow, which make the cambium ring become so dense and really hard and strong. perfect for extreme weatherproof furniture. Also one thing, size are matter…tree diameter are a crucial parts to determine indonesian teak patio furniture quality. the bigger the the tree means the more dense and hard the plank would be. we only use minimum tree diameter of 30 cm, we dont want to have problems with our furniture so we take full precaution to prevent that. which is by using best materials available. 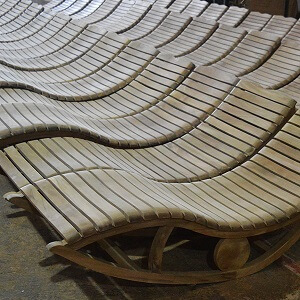 In order to give option to our customers, we can work with various material to produce indonesian teak patio furniture including combinations of wood with aluminum, stainless steel, wrought iron and synthetics materials like rattan or polyester fabrics. Please contact us if you want to build your outdoor furniture with us. give us a call or write us emails which available on contact page.